By far the most alarming feature of the Zika virus now marching across South America and the Caribbean is its threat to fetuses. Last month the U.S. Centers for Disease Control and Prevention declared that “a causal relationship” exists between the virus and brain abnormalities in newborns—most noticeably a small head, known as microcephaly. But just how a mother’s infection harms the fetus, and how to prevent the damage, is uncertain. New animal models are now pointing to answers. Pregnant monkeys are showing hints of fetal damage. But the most dramatic results come from mice. Mouse studies published this week inCell and its sister journal Cell Stem Cell and in Nature show precisely how the virus slows fetal growth, damages the brain, and leads to miscarriage. Two of them also prove for the first time in an animal model that Zika virus can cause microcephaly in fetuses. Together, the findings indicate that the virus by itself can wreak havoc, says Michael Diamond, a viral immunologist at Washington University in St. Louis in Missouri who led the Cell study. “Some people feel there are many cofactors like insecticides,” Diamond says. “Our study suggests at least you don’t have to invoke other things.” And by providing an animal model for the fetal damage, the studies should also ease the path for testing potential vaccines and treatments. Mice normally cannot sustain a Zika infection because the virus triggers secretion of interferons, molecules that bolster immune responses. Diamond’s lab circumvented this problem by creating female mice that had a key interferon gene knocked out; in a second experiment, they treated pregnant animals with an anti-interferon antibody. The team then injected pregnant females with a virus isolated from a person in French Polynesia; the isolate is 99% genetically similar to the one now circulating in Latin America. In the knockout mice, the virus replicated to higher levels than in those treated with the antibody, killing most of the fetuses. The researchers found high levels of Zika virus in the placentas—1000 times more than in the mother’s blood—supporting the hypothesis that the virus harms the placenta, which, in turn, cuts the blood supply to the fetus, Diamond says. Pregnant mice treated with the antibody still made enough interferon to partially control the infection and allow the pups to survive. Mirroring effects seen in humans, they were born small, a condition known as intrauterine growth restriction. In both sets of mice, the virus also turned up in fetal heads, Diamond says, suggesting that it causes brain damage directly as well as by impairing the placenta. That’s consistent with earlier in vitro findings that Zika can infect and damage human neural precursor cells. Neither set of pups developed microcephaly, which Diamond says could be because the researchers infected the mothers so early during pregnancy that not much brain development had yet occurred. The two other mouse experiments, published in Cell Stem Cell and Nature, did document microcephaly. Neither team manipulated their mice to make them more susceptible to the virus. In the Cell Stem Cell study, Zhiheng Xu of the Chinese Academy of Sciences in Beijingsidestepped the mice’s natural resistance to Zika virus by injecting a Samoan isolate directly into fetal brains. In Nature, Fernanda Cugola of the University of São Paulo in Brazil and co-workers injected a Brazilian isolate into the tails of a strain of mice that are naturally immunocompromised. Diamond notes that the Brazilian-led team injected an “astronomical amount of virus” through the intravenous route, which may have sent the virus directly to the placenta and helped dodge the antiviral immune response. Both studies found malformations associated with microcephaly, including what’s known as cortical thinning and smaller brains. The two reports also showed that Zika virus infected and damaged neuronal stem cells harvested from mice and humans. “If you see consistent phenotypes in different models, the things that are happening are probably important,” says Guo-li Ming of Johns Hopkins University School of Medicine in Baltimore, Maryland, who led the earlier studies of Zika in human neural progenitor cells. The researchers who study these various mouse models acknowledge that they differ from humans in many critical ways. “It’s very difficult to study humans directly,” Diamond notes. Yet he stresses that these mouse models give insights into pathogenesis and will allow for high-throughput screening of drugs and vaccines against the virus. Pregnant mice engineered to have higher levels of Zika virus had smaller fetuses (top) than normal dams (bottom). Monkeys are naturally infected with Zika virus and are far closer to humans in many ways, and at least a half-dozen studies are underway. In an unusual twist for the primate research community, investigators from four U.S. labs have been posting data from their monkey Zika experiments on their websites in near real time, before publication. “We decided that the best thing for the community was that information be made available as widely as possible and freely available,” says David O’Connor, whose group at the University of Wisconsin, Madison, is furthest along in studying Zika infection of pregnant monkeys. One pregnant rhesus macaque that O’Connor’s group is following was 50 days postinfection at last report, and a little more than halfway through her pregnancy. 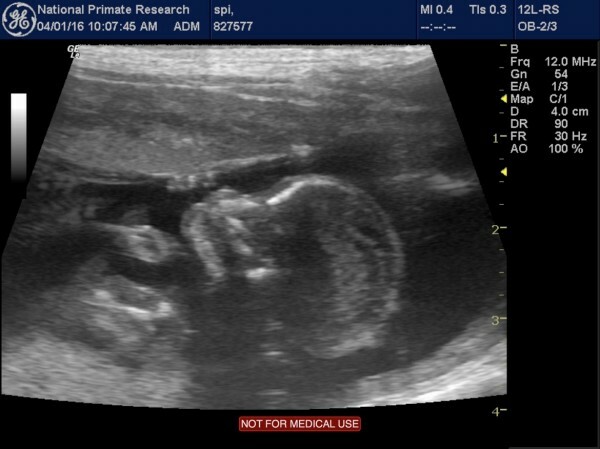 Sonograms of the fetus—which are posted online—“sort of” show evidence that the head circumference is small, but O’Connor and colleagues “are not drawing too much attention to it,” he says, because it’s not that far outside of the normal range. The group will know for sure after they perform a cesarean section on the mother—which will also let them obtain the placenta, normally eaten by rhesus mothers. “I hope we can accelerate the information about what’s going on in people,” he says. Previous Post Hepatitis C named No. 1 infectious disease killer in U.S.